One-to-One Marketing, also called personalized marketing, is a great method in which to connect with your customers. 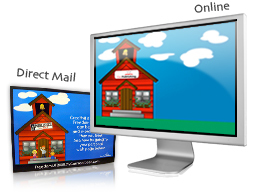 One-to-One Marketing campaigns utilize personalized direct mail, email blasts, and the Internet to connect to your customers in an individual and unique manner to provide and gather information. Through these processes, you can gather and track information which can help you generate new customers, or become better acquainted with your current customers. Would you like to know more or set up a meeting with our One-to-One Marketing advisor?